Woodburn Fire Department hosted volunteer firefighters from Nogales, Mexico last week. The firefighters brought some unusual companions: a group of puppets based on local firefighting heroes in Nogales. 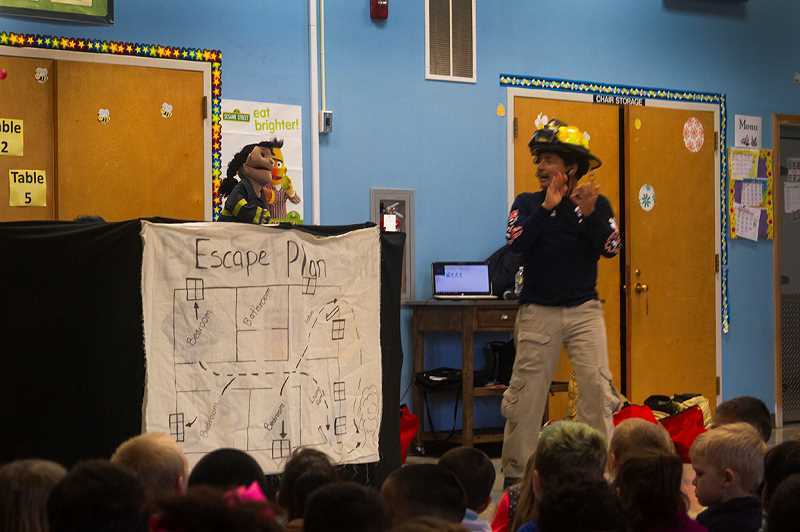 The firefighters performed puppet shows about fire prevention at elementaryschools in Woodburn, Gervais, Mount Angel and Salem and with the Migrant Coalition, reaching about 2,000 students, according to Woodburn Fire Chief Joe Budge. Jesus Roberto Martinez, fire chief of Bomberos Preventivos de Nogales, said that he started the fire prevention education program in Nogales to prevent the deaths of children in fires. "We started the show because there were a lot of children being burned in fires, and about 10 deaths every winter," Martinez said. Many children were caught in fires in their homes due to accidents involving matches and lighters or propane, he said. Martinez organized a group of volunteers and began distributing a coloring book with fire prevention messages. Then, seven years ago, he had the idea to perform puppet shows for children. "You can see the looks on their faces, they are emotional and they are involved with what we are teaching," Martinez said. Martinez said he was inspired by Sesame Street, which he loved to watch as a kid. He would use his hand as a puppet and imitate the show's characters. "Every time I was speaking like that to my mom, she was like 'Roberto you're crazy,'" he said. His love for puppets wasn't so crazy after all. Since he started teaching fire prevention with puppet shows, Nogales' child death rate in fires dropped to zero, Martinez said. Woodburn firefighters Raul Garza and Juan Armenta were connected with Martinez when they began a drive to send used fire gear to volunteer fire departments in Mexico. Rotary clubs in the U.S. and Mexico and Shriners International began organizing donations to fire departments in Mexico after a fire at the Hermosillo daycare center in Hermosillo, Sonora in 2009 killed 49 infants and toddlers and hospitalized 40 more with burns. Volunteer firefighters lacking protective gear and wearing bandanas and t-shirts over their faces struggled to rescue children from the building. The two Woodburn firefighters were inspired to travel around the state during their time off collecting gear from Oregon fire departments. The only assistance they receive is from the Rotary Club, which helps to coordinate sending the gear to departments in Mexico. "Most of the fire departments in Mexico are 100 percent volunteer," Armenta said. "They don't have anything. They wear carpentry gloves and bandanas soaked in water on their faces." The two have been collecting and donating gear for the last 10 years, sending vests, gloves, goggles, hoses, an estimated 1,500 uniforms, air respirators and medical equipment. They have also managed to donate one fire truck, two ladder trucks and three ambulances. "We're helping our fellow brothers in Mexico to have proper equipment and battle fires safely," Garza said.